Why yes, that is Charles Vess artwork on a Subterranean Press limited edition of a new novella by one of my favorite authors! It’s so pretty I almost don’t want to touch it. almost. I want to trace that signature over and over again, learn the shapes and patterns my hands and fingers make, and memorize the order, turn the movements into a mantra. and then the logical part of my brain starts ticking. . .
number 56? Maybe she got to this one before her hand got tired. 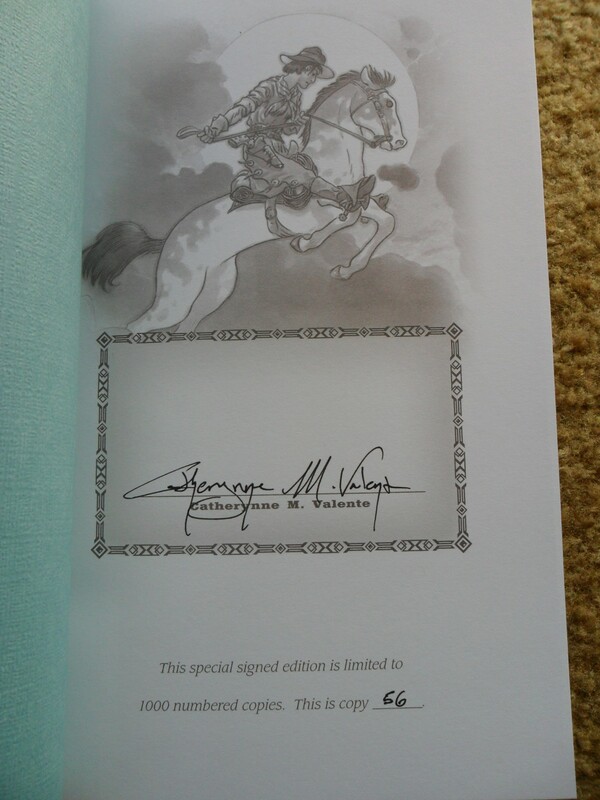 Do authors sign all the books all in one day of wrist wrenching carpal tunnel risking signature scrawling? Or do they do a dozen at a time? Do the pop in the extended edition of Star Wars to stave off the boredom? what if the author messes up or the pen runs out? The recently announced Locus Awards are awarded every year by a readers poll done by Locus Magazine. These have been going since 1971, and are often an influencial precursor to the Hugo awards, which will be awarded later this summer. It’s only these last couple years that I’ve been blogging that I’ve paid much attention to awards. Honestly, for the most part, a list of award nominees more often than not elicits a mostly “eh” response from me. Maybe I’ve heard of the authors, maybe I haven’t, and there’s a decent chance I haven’t even read any of the books or short stories that are up for an award. Good thing I have a scifi/fantasy blog, and have pretty much been reading nothing but scifi and fantasy for the last little while! For the first time, ever, I’ve actually read a small chunk of these. Ok, maybe not a respectable amount, but way more than in previous years. For the first time, ever, my mind is responding with a “sweet! I’ve read that!” or at least a “I’ve heard of that, and I really want to read it!” instead of “meh”. Here are this years Locus Award winners (bolded) and nominees. If I reviewed the piece, I’ve linked to it. A few questions for you to contemplate as you peruse the list: how many of these author, works, editors, authors and publishers have you heard of? How many of them have you read, or are interested in reading? If there was an illustrated book of bedtime stories for grown ups, I image it would look something like 1001 Nights of Snowfall. A dozen or so illustrated stories of varying length, this graphic novel almost begs to be read out of order, depending on the type and length of story you want at bedtime. The overarching story, told between the fairy tales is that the Fables are on their way to the New World, having been pushed out of Europe by the Adversary. Hoping for a military alliance, Snow White visits the world of Arabic Fables to speak with the Sultan. After weeks of being ignored, she finally wins an audience with him, to find she will be treated the same as his other brides – the Sultan plans wed her, bed her, and behead her in the morning. Snow, thinking fast, offers to tell the Sultan just one story before he cuts her head off, and he obliges. If you’re thinking Scheherezade, you’re on the right track. 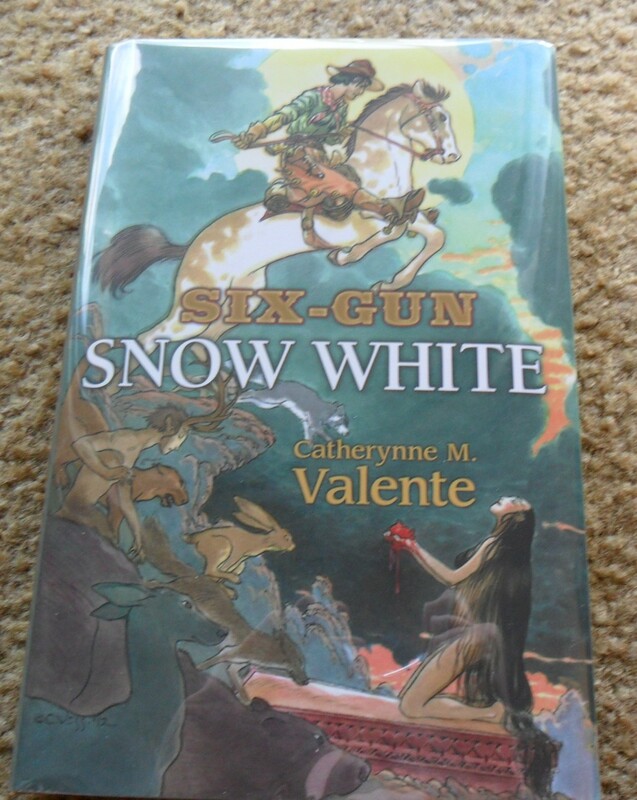 Written by Bill Willingham and illustrated by a handful of artists in almost a mosaic style, Snow White tells the Sultan of how her divorce from Prince Charming came to be, or frog princes and lost memories, of how the Big Bad Wolf came to be, of a beautiful woman who grew up to be a bitter and vengeful witch, and of how King Cole became the mayor of Fabletown, now being built in New Amsterdam.